“Sisters, by the way, have you heard, are doin’ it for themselves.” Why am I quasi-quoting the Eurythmics and Aretha Franklin? Fair question. Simple. In season one of the sitcom Playing House (2014-17), Jessica St. Clair’s Emma employs the line to encourage Lennon Parham’s recently separated and incredibly pregnant Maggie to cast aside fears about her high school marching band’s 15th anniversary and embrace the musically feminist salvo and subsequently the baby bump bulging through her baby blue band uniform as she “crabwalks” across the living room. The duo returned to this quotation often and it became a sort of rallying cry for their dedicated fans, the #Jammers. It also cuts to the chase regarding the kind of emotional and physical female labor driving Playing House and its creators, as they evoke both a uniquely 21st century kind of multi-platform activity and a projection of historically feminized notions of emotional labor. Women have historically been expected to bear the burden of emotional labor and combine it with the associated physical exertion of giving birth, rearing children, and maintaining a home. In short, women are supposed to nurture. 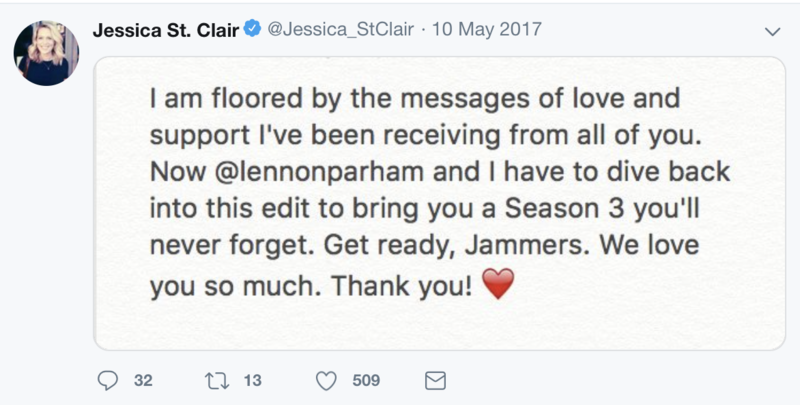 Over three seasons, St. Clair and Parham did just that over various sites of the Playing House footprint, blending the emotional labor of their real-life relationship with that of their onscreen alter-egos, laboring at the behest of advertisers and the USA network, and embracing and affectively cultivating a vibrant female fanbase. This all came on the heels of a nearly twenty-year working relationship including improv at Upright Citizens Brigade and their short-lived 2012 sitcom Best Friends Forever, and ultimately the personal and professional cultivation of what Parham calls “the most romantic relationship” of her life. [ (( Lennon Parham, Interviewed by Kelly Kessler, 27 May 2015.))] For the best friends, Playing House became an intense and contextually-porous emotional and physical production. A similar emotional and physical labor carried over into marketing as USA continuously altered airing patterns for the show and Parham and St. Clair created various types of content to sell the show to their specific audiences. After a low-rated season one, USA worked to capitalize on what they saw as the show’s more prominent online following. During season two the network dropped episodes online one-week prior to their actual airdate, and then for season three the entire season dropped online in one day, with episodes airing back-to-back, two episodes at a time, for that and for the next three Tuesdays. The two worked diligently to keep the show from suffering the same fate as Best Friends Forever. With USA’s late renewal announcements and shifting distribution strategies, Parham and St. Clair creatively and emotionally hustled to nurture their televisual baby and the fans who loved it. They cared for the show, advertisers, and fans like steadfast mothers. 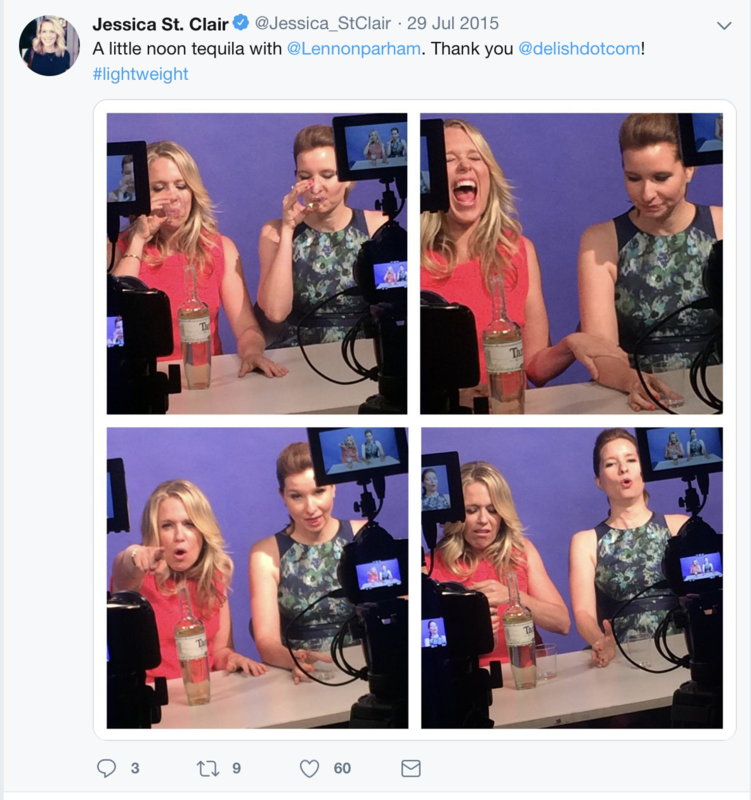 During seasons two and three, they personally created show-styled, branded online content starring Emma and Maggie gushing over the wonders of Toyota, Samsung, and Xfinity. On the fan-front, Parham and St. Clair tirelessly nurtured those who rallied around the show. With a less-than-robust social media buy-in by USA, they cultivated their Pinterest, Tumblr, Facebook, and Twitter profiles. They live-tweeted each episode, commenting on, liking, or retweeting nearly every fan tweet. Fans saw themselves as a Playing House family, led and nurtured by the show’s dual matriarchs. 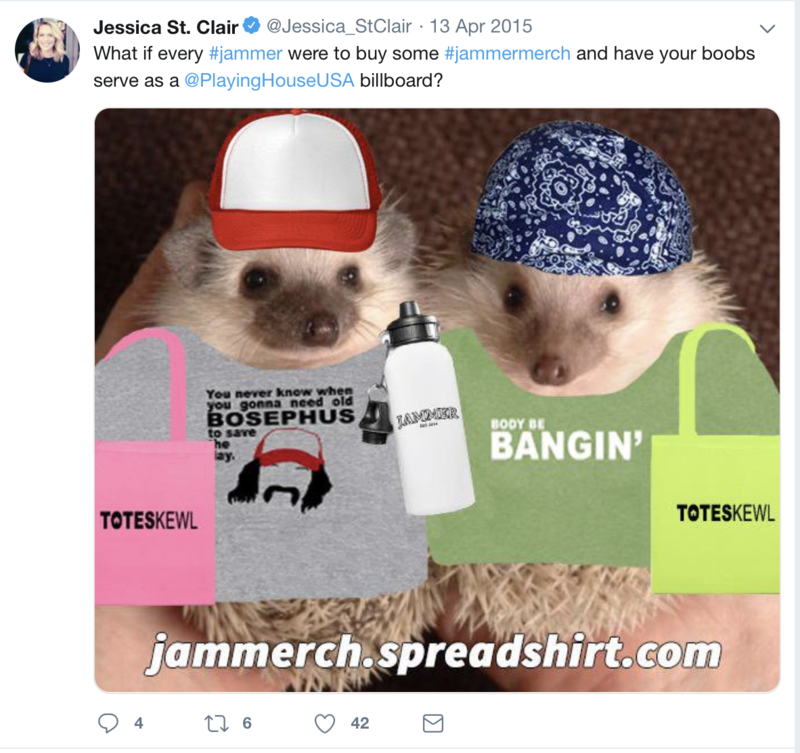 Through tweet-streams, the duo reenacted their own close relationship and constructed a parallel one with the #Jammers, letting them in on inside jokes and making them privy to private joys and sorrows. 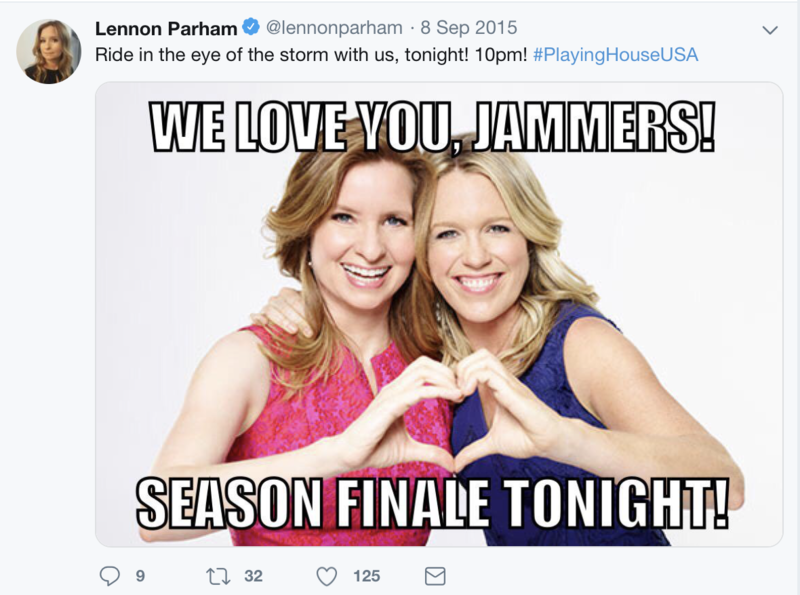 This “inviting in” included staged Twitter and YouTube announcements for season two and three pickups/premieres and a virtual hug to grieving fans upon the show’s cancellation, offering them the strength to power-on and a hope for the future. Their committed physical and emotional labor came back to them tenfold through that of the fans themselves. 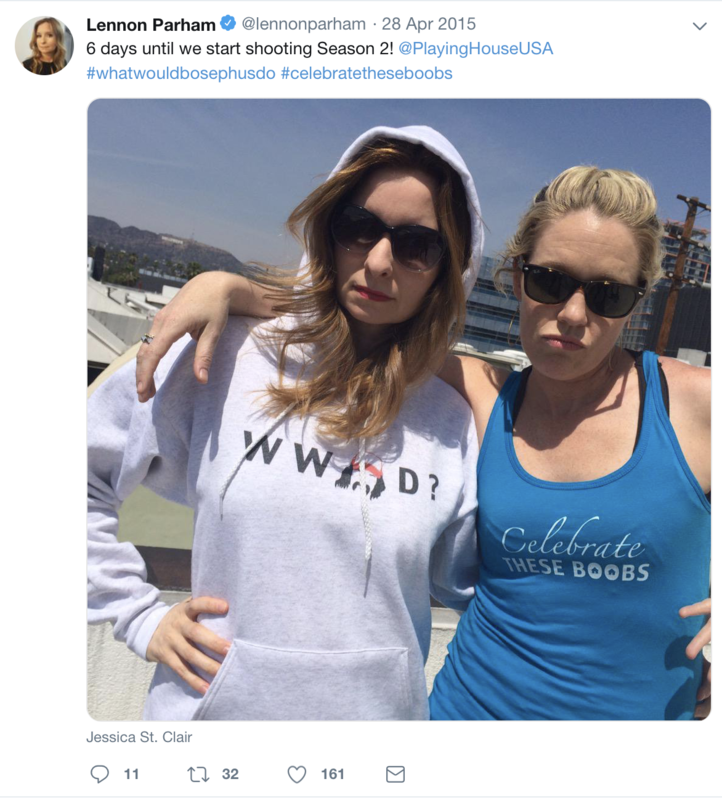 Alongside the passionate fans tweeting and gif-creating, twin sisters Nicole and Danielle Giaimo launched a social media-responsive Playing House merch site. I know, fan activity and celebrity-driven social media engagement aren’t boundary-breaking in a 21st century/Web 2.0 TV era, but the multi-tiered online/onscreen/behind-the-scenes, upfront, unapologetic emotional work of these women converted me into a #Jammer. Alongside the darkness of Girls and biting critique of Broad City and Inside Amy Schumer, they blended the joy of Kate & Allie and Laverne & Shirley with a renewed personal and emotional flair wrapped in 21st century possibilities. #Jammer4life, #bodybebangin, #bodyroll; #hellyeslife; #celebratemescones.